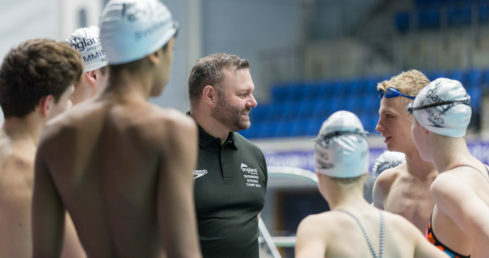 The Institute of Swimming (IoS) launched the new set of Swim England coaching certificates last autumn in order to advance swimming coaching and support continued success on the world stage. The set of certificates cover the four main disciplines (swimming, diving, synchronised swimming and water polo) going through three levels from Assistant Coach, Coach to Head Coach. These have been developed with experts from British Swimming, Swim England, the IoS, and the British Swimming Coaches Association (BSCA). This year’s coaching tutor training programme aims to train new tutors in the disciplines of competitive swimming, diving, water polo, synchronised swimming and open water. We are excited to be supporting the training of the next generation of coaching tutors for the Institute of Swimming. Having consulted across the organisation, we have a clear vision of where coaching tutors are needed throughout the country; so this will help steer the shortlisting process. If you want to know more about the role of a Swim England Tutor, go to our ‘Becoming an Educator’ page where you can find out more about the Tutor Training Programme and also find the link to access the person specification for the Coaching Tutor Training Programme 2017/2018. Applications will close on Friday 27 October 2017 at 5pm.